The house is composed of a kitchen with a large traditional open fireplace, a living room and two bedrooms, and it also has a storage room. The house is set over one floor, with a footprint measuring 67 square meters and is connected to mains electricity and mains water. The exterior walls of the house are in good order of repair. The interior does need complete renovation and it is possible to increase the footprint of the house. There is a wonderful plot of land measuring a total of 7740 square meters, with an old irrigation channel supplying water. At the end of the land there is a stream. There are a large number of different mature fruit trees as well as plenty of olive trees on the land. On the other side of the road there is a mixed forest sloping up the hill. The property is located within a 10 minute drive (6,7 km) from the nearest river beach on the shores of the Castelo do Bode lake at Aldeia do Mato. Here you can hire canoes, kayaks, speed boats and sail boats and go for refreshing swims, there is also a café/bar. 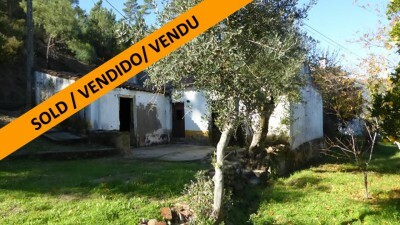 The property is a 13 minute drive (8 km) from the larger town of Abrantes away. Abrantes has several large supermarkets, schools, library, post office, health center, river marina, banks, hospital, shops, cafe bars, restaurants, cinema and go-karting circuit. Abrantes also has a main line train station which goes to and from Lisbon. There is also a bus station which services the region and more national routes. The nearest airport is in Lisbon, a one hour and 20 minute drive away.